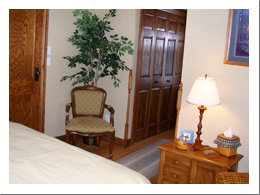 The Family Heritage guest room is located on the first floor of the inn. A private bath is attached with a whirlpool tub/shower. This room is filled with pictures of the past. In addition, the room features a queen-size bed. Savor your view from the two windows looking towards our organic garden and the breathtaking hills. Take time to sit and reflect on your drive through this Driftless Kickapoo Valley that surrounds us.